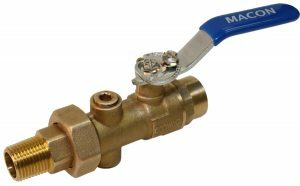 Model BB Union End Ball Valve is offers shutoff and throttling. 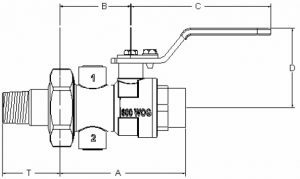 The position indicating Memory Stop provides quick and easy flow setting with a single screw adjustment. The ball valve has a chrome plated ball, Teflon seats, a blowout proof stem with double EPDM O-ring seals and dual plugged accessory ports. The union has an EPDM O-ring seal and tailpiece available in MNPT, FNPT, and SWT end connections. Ball: Chrome Plated Brass, full port, 100% positive shut-off. Stem: Brass. Optional 316 Stainless Steel.